My research program focuses on the most frequent metabolic and endocrine diseases, including obesity, diabetes and polycystic ovary syndrome in women, and their related heart problems. I organize clinical studies which translate findings from my basic research and recruit patients from our NHS and community partners, thus I run an established clinical research program with direct links between the NHS, the community and our WMS labs. My goal is to further develop our research for patient benefit approach and have a significant impact on the research output of our division/university, the patients’ involvement in research and the quality of care offered to our local society and patients. My research goals span basic, translational and clinical research. 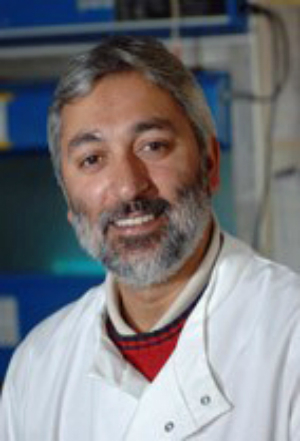 Basic scientific techniques available in my group include electrophysiology, the Langendorff system, myography and standard molecular methods (e.g. PCR, western immuno-blotting, ELISA and Bioplex analyses). The research models utilized within my group include animal studies, as well as cellular culture systems. My basic research interests include the dysregulation of energy homeostasis and the adipose tissue secretome in relation to cardiometabolic disease, particularly the implications of novel biomarkers/factors and orexigenic molecules in this context. Thus, I also run an established adipose tissue biology group studying both white and brown adipose tissue and the role of new adipokines and relevant intra-cellular signalling cascades within the remit of the aforementioned research areas. At the clinical front, using clinical paradigms of obesity, diabetes and polycystic ovary syndrome (PCOS), all of which manifest cardiometabolic abnormalities, my group explores traditional and non-traditional cardiovascular risk factors, aiming to further elucidate the related pathophysiology. My multidisciplinary research team includes diabetologists, endocrinologists, gynaecologists, cardiologists, basic scientists and research nurses with significant experience in clinical trials and translational research. Importantly, my group has identified through clinical studies the dysregulation of key adipokines involved in human atherogenesis and cardiac disease. We are currently looking into further developing these research findings into clinical therapeutic interventions. Moreover, our patient cohorts include a fairly balanced mix of both Caucasians and Asians, further allowing us to address potential genetic and ethnic differences in the pathogenesis of cardiovascular and metabolic disease. Overall, I have been responsible for conducting multiple important studies that have produced seminal publications in peer-reviewed journals (>145 papers in PubMed) which have been highly cited. Furthermore, I have successfully completed as the Principal Investigator numerous research projects and clinical trials funded by the British Heart Foundation, the Wellcome Trust, the Prader Willi Foundation, Coventry Charities, Heart Research UK, IPSEN, Novo Nordisk, while I have also contributed as a co-investigator in two research projects funded by the European Union and the National Institutes of Health. Finally, I have successfully supervised almost 30 postgraduate students who have completed their PhD or MD degree with my research group. The anti-atherogenic aspect of metformin treatment in insulin resistant women with the polycystic ovary syndrome: role of the newly established pro-inflammatory adipokine Acute-phase Serum Amyloid A; evidence of an adipose tissue-monocyte axis. Atherosclerosis. 2011;216(2):402-8. Metformin decreases angiogenesis via NF-kappaB and Erk1/2/Erk5 pathways by increasing the antiangiogenic thrombospondin-1. Cardiovasc Res. 2009;83(3):566-74. Omentin-1, a novel adipokine, is decreased in overweight insulin-resistant women with polycystic ovary syndrome: ex vivo and in vivo regulation of omentin-1 by insulin and glucose. Diabetes. 2008;57(4):801-8. Visfatin induces human endothelial VEGF and MMP-2/9 production via MAPK and PI3K/Akt signalling pathways: novel insights into visfatin-induced angiogenesis. Cardiovasc Res. 2008;78(2):356-65.